US PRESIDENT-ELECT Donald Trump said he has picked the tough-talking retired general James Mattis to be his defence secretary as he soaked up adulation at a buoyant Ohio rally that recalled this year’s rough-and-tumble campaign. The splash of hard news came during a sea of soaring –and then blunt – rhetoric from the 70-year-old Republican billionaire, who was speaking at his first post-election event following days of meetings about forming his cabinet. “We are going to appoint ‘Mad Dog’ Mattis as our secretary of defense,” Trump told cheering supporters in Cincinnati, referring by nickname to the retired four-star Marine general who headed the US Central Command, with authority over US troops in Iraq and Afghanistan. “He’s our best. They say he’s the closest thing to (World War II) general George Patton that we have,” Trump said, divulging his pick ahead of schedule after his transition team said there would be no more cabinet announcements this week. During his military career, Mattis commanded a battalion in the Persian Gulf War and then went on as a colonel to lead a regiment in the war in Afghanistan. He was known throughout his time in the military for being a hands-on leader, and as a major general he commanded a division during the 2003 invasion of Iraq. He sparked controversy in 2005 when, during a panel discussion in California, he said it was “fun to shoot some people”. 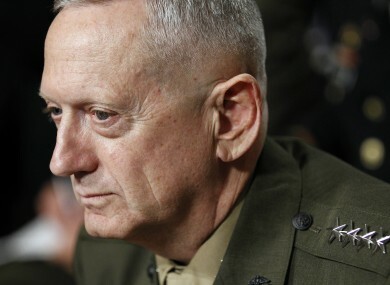 Mattis will require both Senate confirmation and a special waiver of a law that bans uniformed military officers from serving as secretary of defence for seven years after leaving active duty. At least one Democrat, Senator Kirsten Gillibrand, already signalled she will oppose the waiver. Trump’s surrounding himself with military figures – he has picked retired lieutenant general Michael Flynn to be his national security advisor and is considering retired general David Petraeus for secretary of state — has unnerved some observers who point to America’s long tradition of civilian government. Adam Schiff, the ranking Democrat on the House Intelligence Committee, praised Mattis’ “knowledge, experience and leadership” but also expressed concerns about the precedent being set. “That concern would be further heightened should the president-elect nominate any further military personnel to high positions of civilian leadership in his administration,” he said. Americans will “come together — we have no choice, we have to,” he added. On the economy, “Americans will be the captains of their own destiny once again,” he promised. He also vowed to try to work with Democrats to end gridlock in Congress. Email “Trump picks man who thinks 'it's fun to shoot some people' for defence secretary ”. Feedback on “Trump picks man who thinks 'it's fun to shoot some people' for defence secretary ”.